Kerry Dunn graduated in 1999 from Ringling School of Art and Design with a major in illustration. After graduation Mr. Dunn moved to New York City to attend the famed Art Students League of NY and study with internationally-renowned portrait painter Nelson Shanks. Later that year, he was invited by Mr. Shanks to move to Philadelphia to be a part of the new painting school Studio Incamminati. Since its beginning in 2002, Studio Incamminati has grown to become a Philadelphia institution, renowned for its focus on traditional painting methods taught within the master/student environment. 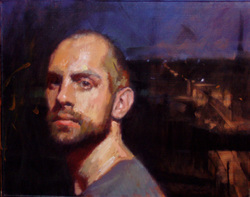 Mr. Dunn currently currently lives and works in Philadelphia and teaches at Studio Incamminati as part of the core faculty.